Kazakhstan’s biggest, most vibrant and most pleasant city is the former capital Almaty. With its parks, avenues and cafe terraces spilling out on the street, it’s little surprise that Almaty has always been a favoured home for Central Asia’s literati. But there’s more than city life here. Hugged by the snow-capped Ili-Alatau mountains on its doorstep, escaping the crowds for a hike or a day of skiing is dead easy. One moment you are looking down a tremendous crack in the earth at Charyn Canyon, the next you’re on a steppe safari tracing wild donkeys and shifting sand dunes. Take a stroll through Panfilov Park for the colourful wooden Zenkov cathedral and the Musical Instruments museum. Stop by the Green Bazaar to see some of the city’s tremendous diversity reflected in the faces of shoppers, and taste everything from Korean salads to camel milk balls dipped in honey. In winter, you can go ice skating on the natural ice of Medeo, or take a cable car up to the ski resort of Shymbulak. In summer, the area becomes a hiker’s paradise, with the Big Almaty Lake a blue jewel in the city’s crown. Outside of town, Charyn Canyon invites comparisons to the Grand Canyon and Altyn Emel National Park is the best place in Central Asia to see rare animals like ibex or wild donkeys against the backdrop of sand dunes and colourful mountains. Back in Almaty, the Arasan baths are the perfect place to relax after a whirlwind tour of the region. In 1911, an earthquake triggered a large landslide outside Almaty, creating a natural dam. In time, a large spruce forest near the dam was submerged and a new lake, called Kaindy, was born. The sunken trees survived and still appear as large masts from lost ghost ships. Underwater, the needles of the spruce remain on the trees, even 100 years later. Because of the clear mountain water, you can see far into the depths of the lake. “Almatau” means mountain of apples. Wild apple trees abound, and the region is widely believed to be the humble apple's ancestral home. Almaty was the capital of Kazakhstan until 1997, when the government moved to newly built Astana. The city’s architecture is a living echo of Kazakhstan’s Soviet past. Medeo is the highest skating rink in the world. Due to its height, the natural ice is super-speedy, and has led to many world records. Almaty is working to curb its traffic problems and nurture a greener image. The city has enlisted famed Copenhagen urbanist Jan Gehl to draw up a master plan for the city’s future. Almaty is Kazakhstan’s main air hub and well-connected to the rest of the world. Flights to other parts of the country and nearby Bishkek take between 45 minutes and two hours. 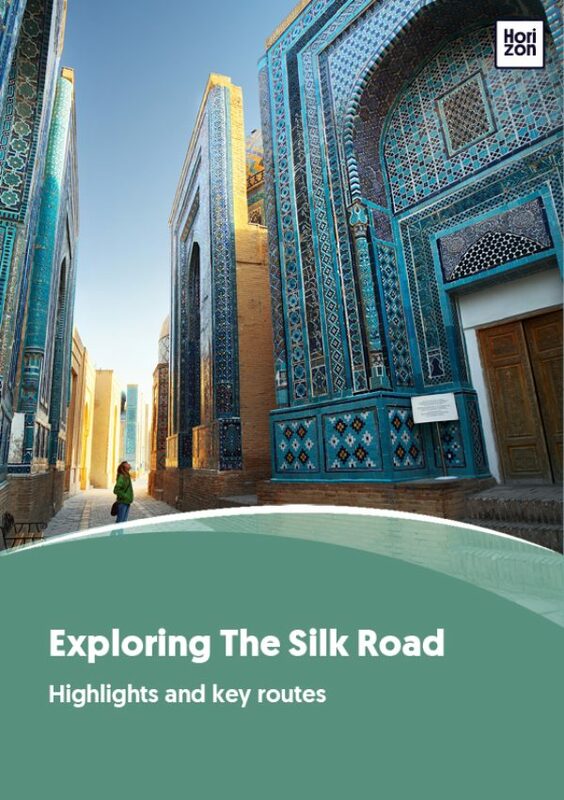 If you prefer to travel by train, there are overnight connections to Astana and Shymkent in 12 hours, while it is a four-five hour drive across the steppe to get to Bishkek. Most tour operators use 4WD to get to the sights in the surrounding region such as Charyn Canyon, Altyn Emel, and Kolsai Lakes. Inside Almaty, almost any car doubles as a gypsy cab. Just stand at the side of the road and stick out your arm to hail a car and discuss a price. Ride-hailing apps like Uber and InDriver are another option, while taxi companies charge a little bit more; still, prices should not exceed $2-3 for the longest rides.